I came across a very interesting article a few weeks ago regarding visual representations of 122 linguistic differences in the speech of Americans. The maps were developed by Joshua Katz, a Ph.D. student in statistics at North Carolina State University and are a visual representation of what words are used by people across the United States to represent various concepts and how those words are pronounced. Having lived my entire life in the Midwest (Oklahoma, Missouri, and Kansas) it was easy to see in my own responses to the questions that those of us who live here truly are a melting pot of the rest of the country as frequently the heat-map of the responses from northeastern Oklahoma were a mixture of the strong preferences in other regions of the country. Then there were the phrases that most of the country has never heard of. For example, around here (and most of the country apparently) there is no special word for when it is raining and the sun is out. In some of the country this is called a “sun shower” although in a few locales in the south this is called “the devil is beating his wife.” Apparently the rain is her tears. I could go on and on about the maps and how interesting I found them, but instead I encourage you to head over to the full listing yourself and check them out. 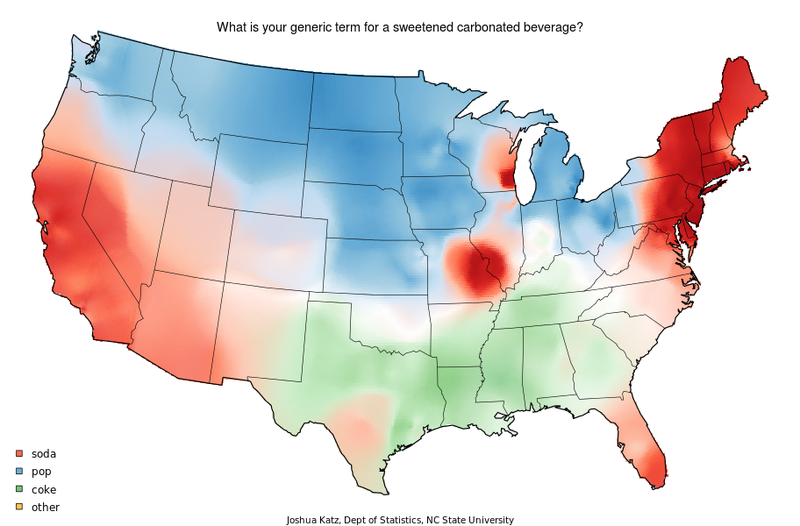 You can also look up how your community’s dialect compares to the rest of the country with the Aggregate Dialect Difference maps and see who else in the country talks like you do. Posted on September 23, 2013, in Uncategorized. Bookmark the permalink. Leave a comment.